Efforts are underway to establish minimum lighting requirements for indoor cultivation of plants. Lighting fixtures will have to produce a minimum PPF (Photosynthetic Photon Flux) of 1.6 μmol/Joule to meet this new standard. While this may sound like a step in a positive direction, this metric does not represent the full impact lighting has on plant growth nor does it address how light affects different stages of plant growth. Indoor cultivation of cannabis has exploded over the past two years. With that, energy consumption in states where cannabis is legal has also sky rocketed. The practice of growing cannabis was estimated to consume 1% of the nation’s overall energy production in 2012. Indoor cultivation of cannabis is now the nation’s fastest-growing energy-intensive industry. Electric utility companies have taken notice and are looking for ways to offer rebates to growers for lowering their energy consumption. Many energy-service providers have targeted “grow lights” as one of the major areas for energy reduction. They are looking to regulate and restrict the type of lighting that is to be used. The newly created metric of 1.6 μmol/Joule of PPF provides a standard utility companies can use as a baseline to offer rebates. These standards will soon have an impact on growers and on their yields, both quality and quantity. This new standard is only focused on the PPF in the PAR (Photosynthetic Active Radiation) range. In short the standard is only looking at the efficiency of a lighting system to producing energy between 400 and 700 nanometers (nm). Though research has shown the 400-700nm range is most effective in stimulating photosynthesis, the PAR measurement can easily be misconstrued and applied erroneously, providing less than a full benefit to plants. The spectral charts below show a Low Pressure Sodium (LPS) spectrum versus a High Pressure Sodium (HPS) spectrum. The LPS spectrum is very limited in its quality of light verses the HPS. But the amount of light energy produced by the LPS is far greater than that of the HPS. The PAR efficiency of the LPS is actually greater than that of any other light source. So, by PPF efficacy calculation, LPS would meet the minimum 1.6 μmols/Joule of the proposed standard. Yet the lack of quality light across the entire spectrum would produce very poor plant growth. The PPF measurement of PAR only counts the total amount of light photons present between 400-700nm. It does not differentiate between photons at 420nm versus photons at 660nm or any other nanometer within the PAR range. With that said, studies have shown plants possess photoreceptors that are stimulated by UVA/UVB (300-400nm) and by far-red (700-800nm) wavelengths of light. Far-red wavelengths were shown to increase photosynthesis. 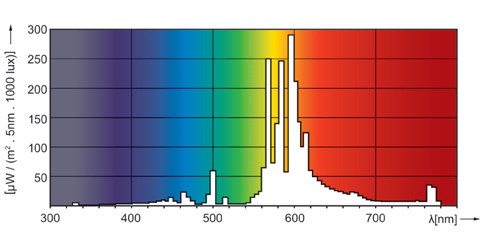 Many growers are seeing the benefits of spectral quality versus higher PAR with lighting products such as Ceramic Metal Halide, enhanced spectrum T5 fluorescents and Daylight Metal Halide’s. These lights do not produce the PAR output that a Double Ended HPS grow lamp will produce. But they do produce much higher quality cannabis. Photomorphogenesis is the control exerted by light over growth, development, and differentiation of plants that is independent of photosynthesis. Different receptors, such as phytochromes, cryptochromes, and phototropins in plants react differently to those parts of the spectrum that are not included in the PPF metric. For example, UVA and UVB (<400nm), as well as far-reds (>700nm) have a significant effects on plant growth. So they shouldn’t be ignored, particularly in a metric that is supposed to define lighting for horticulture. For example, plants use UV to stimulate photosynthesis, though it has less of a stimulating affect versus other nanometers of light. But UV can provide benefits, as well as problems, as too much can cause cell damage and with too much exposure even kill plants. UVA rays (315-400nm) and UVB rays (280-315nm) can penetrate deeper in soil and water due to higher scattering efficiency compared with other longer wavelength light, which will benefit for plant seeding from photon energy absorption perspective. More particularly saying, UV has significant impact for plant early growth. The UVR8, UVB photoreceptor, initiates a molecular signaling pathway that leads to gene expression changes. This signaling output leads to UVR8-dependent responses including UV-B-induced Photomorphogenesis and the accumulation of UV-B-absorbing flavonols. More importantly, UVR8 UV-B signaling represents how plants are able to sense their light environment and adjust their growth accordingly to regulate germination. Plants also need red light in the range nearing infrared wavelengths. Most plant experts know that plants love red light, particularly in and around the 660nm range. But plants also like far-red light, in and around the 730nm range. Many studies have shown that receptors called phytochromes thrive on a balance of red and far-red. The PFF metric does not include any far-red. So plants grown in the absence of this light have to rely on total darkness to make their daily growth loop, thereby inhibiting a better quality of growth and a faster cycle time to bloom and harvest. Photostationary State (PSS) is a good indicator of photomorphogenetic responses in plants. 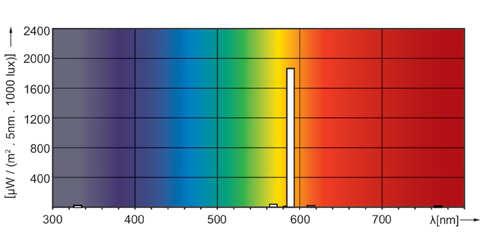 It more closely characterizes how plants react to red and far-red spectra, as well as to the deeper blue and UV ranges of light. 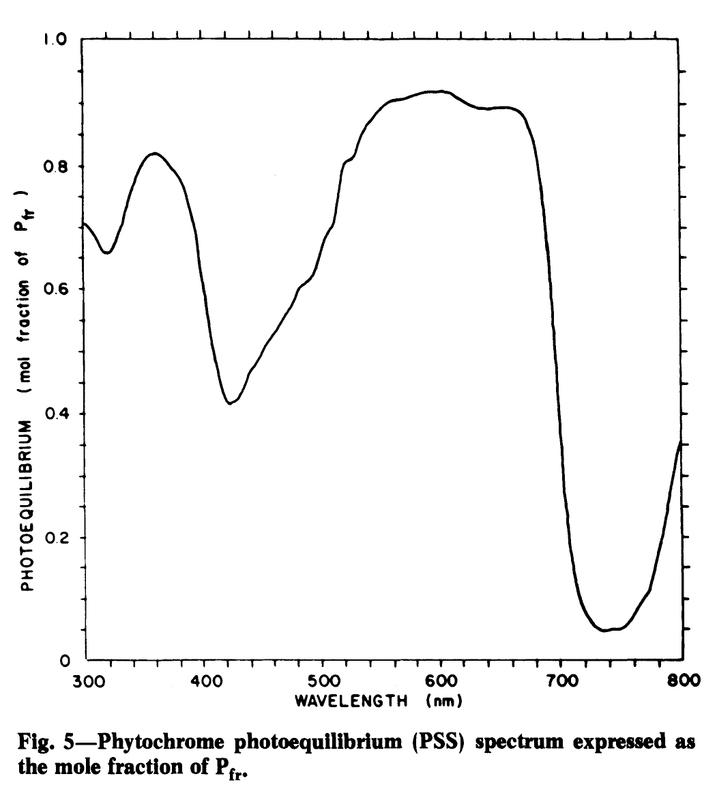 While PPF ignores the upper and lower ends of light radiation, PSS considers the phytochromes in plants (Figure X). Phytochrome is a photoreversible biliprotein which affects plants from seed germination through flowering, and includes the state of photosynthesis. PSS is a direct integration of the energy of phytochrome red (Pr) divided by the sum of phytochrome red (Pr) and phytochrome far-red (Pfr) (Figure Y). 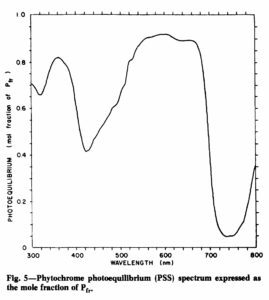 Studies as far back as 1988 have been done to qualify this: Photosynthetic Efficiency and Phytochrome Photoequilibria Determination Using Spectral Data (by Sager, Smith, Edwards and Cyr, 1988). While there may be other parameters to consider alongside PSS, we firmly believe that PSS on its own is a far better comparative metric which can be adopted in order to evaluate different light sources and their ability to grow plants. This is true for traditional High Pressure Sodium, Metal Halide, and Fluorescent T5, as well as LED. In order to do so, however, test and measurement lighting labs will need to outfit themselves with new tools that encompass spectral power distribution measurements down to 300nm. Most can now only measure down to 380nm, a few to 350nm. This doesn’t capture the full effect of UV on plants. All can measure up through 800nm. So the challenge is to get down to the 300nm level, so PSS can correctly be characterized. It’s a small investment to be made by the manufacturers. Only then can the lighting industry finally characterize artificial light into a classification which the agriculture and horticulture industry can use to compare lighting. And only then can everyone begin to establish best practices for saving energy, issuing rebates, and growing the best crops that money can buy. Is It Time to Replace Your Double Ended HPS Lamp? What are Those Burn Marks in my Bulb?